Just as we were all getting used to the idea of having a smartwatch sitting on our wrist, Mondaine throw us a curveball. Their newest offering is the stop2go smart-clock, yes you read that right. A smart wall clock. Sounds pretty technical but in reality this clock really does live up to its name, style wise, the stop2go clock looks very smart; based upon the traditional Swiss railway clock produced by Mondaine, this brilliant 25cm wall clock features the much loved Stop2Go red seconds hand, which stops after just 58 seconds, waits 2 seconds at the top, and then starts moving forwards. Designed to allow for the trains to align before departure, this throwback feature adds a lot of charm to this clock. So it tells the time, great. Well it’s a bit more than that. 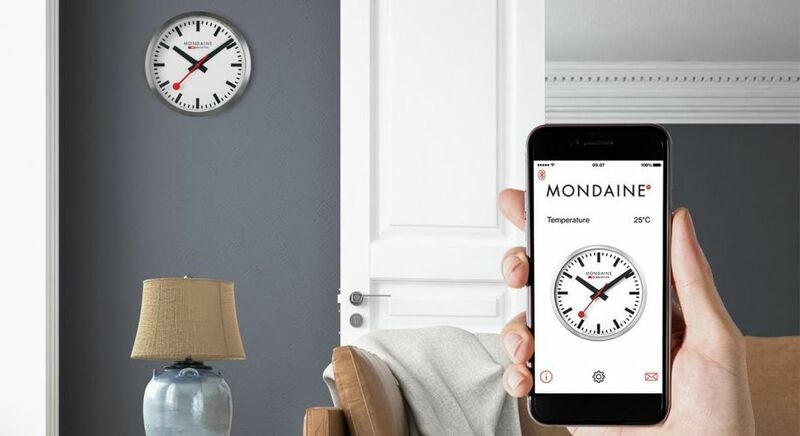 The Mondaine Smart-Clock connects to your smartphone via Bluetooth and will auto-adjust the time for daylight savings which is pretty nifty if you ask us, however this little clock can do a few more interesting things. Sensors in the clock allow for you to check the temperature in the room via the connected App, the app also allows you to turn off the stop2go red seconds hand feature and allow for it to sweep a full 60 seconds rather than stopping at 58 as the clocks in Switzerland. The brushed aluminium case is ideal for both home and office use; the 25cm dial is presented in a crisp white with bold black hour markers and the traditional red lollipop second hand. The MSM.25S10 is a battery powered model and takes the standard AA batteries, these are also supplied with the clock so there's no need to take them from the TV remote. For Mondaine followers this clock is perfect for bringing in a little Swiss horological history to the home and for people who want a nice looking clock then this really is a perfect choice. Mondaine have released many other clock styles with varying dial sizes and case colours though these models do not have the stop2go jumping movement, the incredibly popular A990.CLOCK.16SBB is very similar in aesthetic to the smart clock and is often chosen to display in hotel lobbies and offices. With its feature ticking red second hand it's easy to see why this clock is a top contender. For a splash of colour Mondaine produce their clocks in their signature bright red too. If you want a real statement piece then look no further than the 40cm A995.CLOCK.16SBB, this huge wall clock will stand proudly in any contemporary office boardroom or reception desk. If these clocks don't take your fancy, why not have a look at others in our range, we have a myriad of designs to choose from here at Creative Watch Co!